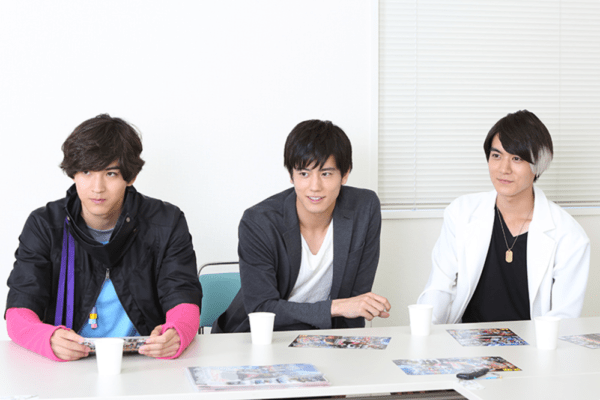 In commemoration of the release, the website Natalie held a roundtable discussion with the main cast of Kamen Rider Ex-Aid. Kamen Rider Ex-Aid the Movie: True Ending was released on August 5th and features the titular character and friends taking on the mysterious Kamen Rider Fuuma, who plans to transfer humans into virtual reality to save his ill daughter. Interviewer: This is the last time everyone will be gathered at Natalie for a roundtable discussion, and as such, I would like to not only talk about the movie, but also the TV series. Lately, in the TV series, there has been an increased sense of medical drama. Matsumoto: In episodes 37 and 38 especially, when Taiga was near death. Matsuda: It comes off as a proper medical drama. Seto: It was difficult portraying those medical scenes! Seto: It could take quite a while. Sometimes we would have to correct a take. Ijima: Right. In scenes where we treat patients, we think of the best way to set their heads down on their sides. Seto: There was no medical supervisor available previously at that time and afterward I found out I did it wrong by phone. Ijima: After all, there might be real doctors in the viewing audience, and they might also see the small details. Matsuda: It’s a great learning experience. Interviewer: In episode 38 when Emu leaves the operating room, he opens the door with his feet. I was surprised by the attention to detail. Seto: You have to open the door with your feet even in real hospitals, right? Matsuda: So, you can’t touch the door with your hands? Ijima: Right, you need to keep your hands above your waist. Interviewer: Matsumoto was also playing the part of the person receiving surgery. Ijima: You were like that for 5 or 6 hours! Matsuda: I wish I had a tasty tube! Seto: Sorry, I touched your stomach occasionally. Interviewer: Have you ever portrayed the same character for a year, and become so influenced by them? Like you’re now able to naturally insert ad-lib. Onozuka: In episode 38, after apologizing to Taiga, Kiriya’s “You’re getting shy! Did you guys make up?” line was ad-libbed. I was actually trying to imitate Haima Kagami’s (Hiiro’s father in the show) “thank goodness, Hiiro!” and everyone burst out laughing because we didn’t get permission from the director for it. Ijima: It’s not easy to ad-lib with our doctor team, but it’s easier if you’re on the Bugster team. Onozuka: Kiriya believes he has a role where he can say whatever comes to mind. When he took Taiga’s arm and asked him directly “what’s with the arm?”, that was also an ad-lib. It actually was on my mind at the start. (laughs) Funny, right? That’s like a connection between patient and doctor. But if I delve into it too deeply, it becomes faulty, so Poppy stops this with her good natured personality. Matsuda: You could hear that when I originally said “Kiriya!” I actually added in an ad-lib at that time. Interviewer: Iwanaga’s role has a high degree of freedom, but how much of it is ad-libbed? Iwanaga: Rather than ad-lib, what was wanted for Dan on location was different from what was written in the scripts. That’s why we’re always thinking “so how will we continue this?” I think of interesting things for this. Among those things we played with was the remaining lives and we would have to check carefully. (laughs) We had to make sure it properly aligned with the screen writer because we killed Dan a lot on site and had to keep a tally of the numbers. Seto: Lately his father has been killing him a lot. Onozuka: Yeah, in episode 41 there was a scene where Iwanaga and myself play a lot. Dan, it was a really wonderful thing. Seto: Even though there were only four lines in the script, there were many cuts. In one cut, the word “death’ wasn’t even written at all, then there were two deaths. Iwanaga: Afterwards, my final ad-lib was when I tickled Emu’s sole. Iwanaga: That wasn’t tickling, was it? The movements were strange, it looked like foot training. Interviewer: This time, the movie’s title is “True Ending”. I think the movie is ahead of the main shooting schedule, were there any difficult parts? Kai: Speaking of the strong developments with some meaning in those two episodes, before we filmed them, it was difficult knowing I must portray a reformed Parado. Ijima: There were only 35 episodes out when the movie was being filmed. Kai: Right. So I didn’t understand the sort of enthusiasm I needed to aim for, so it was difficult. Honestly, I felt like I wanted to do some reshoots because I felt like I understood Parado better over those two episodes. Onozuka: My role in the story takes place right after I’m brought back in the original story. Also, I carry the traits from when I was with Masamune around that time. It was difficult filming my character without the “friendly” trait. Seto: The end credits really is the very beginning for us. Iwanaga: That was also very difficult. Onozuka: But I understood it because I was performing by following the course of events up to that point. I had been gone for a long time. Seto: But before you were revived, you kept reappearing, right? In flashback scenes. Interviewer: The themes of medicine and games are present within the series, this is compared to the idea of “human life” and “continuable data” in the movie. Kiriya is revived as a Bugster, by changing the role he plays from human to Bugster. Was there a change in his consciousness? Onozuka: Everything was entrusted to Emu, and then we had a “Game Over,” but Kiriya didn’t want to die from his viewpoint. There’s no concept of life span or old age, and no blood. But for the current Kiriya, he wants to be someone who is a strength and support for medical care advancement which overcomes sadness. Onozuka: In my opinion, there has been another theme for Kiriya ever since he was revived. But if you say that here, everyone will look at you with pity and I don’t want that. Maybe they’ll enjoy it more if we didn’t say anything and left it up to one’s imagination. Interviewer: Hiiro and Taiga reconciled at the same time episode 35 was filmed, right? Matsumoto: That’s because there was always resentment on Hiiro’s end. Seto: There were times when their relationship became complicated because Taiga was always short with words at first. It’s not like they could say “let’s get along” just because they reconciled. So it’s not like the actors exaggerated that exchange in performance. Ijima: But at first Hiiro used polite language when speaking to Taiga, so he was trying to demonstrate change. The way he dealt with him hasn’t changed but the face behind those feelings did, right? Seto: That’s right. He held feelings where he blamed Taiga for his jerkiness as well as Saki’s death. He realized that wasn’t true but there are parts where he doesn’t want to acknowledge it. It’s not a matter of resenting or not resenting him, the fact that he acknowledges those parts are what changed. Onozuka: If you think of it from the audience’s perspective, any ill resentment they held from the beginning of Ex-Aid has dissolved and I think that’s big. Matsumoto: I’m sure Taiga felt bitter towards Hiiro, however, I wouldn’t call it hate, but it was a burden for him. Even if you say they reconciled, Hiiro feels guilty for choosing to lose Saki’s data. Onozuka: Taiga has a handsome way of thinking, right? Matsuda: Hey, why doesn’t he have a girlfriend? Matsumoto: Good question. I’m sure he wants one. Ijima: Emu wants one too! You don’t see crystal-like young men like him anywhere else! Interviewer: The original story is reaching its final episode, as actors, what will you do once the series ends? Onozuka: Well, hereafter, I, as a handsome actor will…did someone just snort? Onozuka: (laughs) Well, in all seriousness, I will appear in any work whenever I get the chance, and I’d be really happy to have the opportunity to work with the Ex-Aid team again. Matsumoto: Yeah. I’d be happy if we could. Onozuka: In addition to that, it’d also be one benchmark of growth. If we meet again in a different setting, it’d be a great way to show off areas of strength. Kai: In comparison to everyone, I have so much room for growth. Or rather, I have more time to develop since I’m the youngest. Matsuda: What shall we do? Kai: Of course we’re all just beginning as well! (laughs) My start line just happens to be behind everyone else’s. There’s still so much time to work hard in that regard and I don’t want to waste it. I will include everything I’ve learned from this one year, and I want to level up after one year…two years…five years. I want to cultivate the mindset that allows one to continue being an actor. Iwanaga: Because I portrayed Kuroto, if I can hear people say “I want this guy to portray a pervert” or “I want this guy to portray someone strange” I’d be happy. Iwanaga: I want to take that and make it a strong point and add it to my field. Matsuda: I’m okay wearing wigs for a little while. Though they make my head molder. (laughs) The boys who appear in Kamen Rider slowly become famous, and then they eventually grow up to be like the actor that they see in other shows they appear in. Girls can obtain many jobs like in gravure, however, but as an actress, it’s hard to be successful after they graduate. I want to be the role model that lets girls know Kamen Rider is also an opportunity for them. I want to be more successful than the previous heroines before me. Matsuda: I mean…I HAVE done at least two roles in one year. It’s like doing two years worth. I was able to sing, dance, and was able to take on many challenges. That’s why I have to make the best use of it If I’m able to use all of it, I’m sure I’d be able to become successful. Matsumoto: Hmm, as for me, I want to appear in many roles, but I would have more ability for it. In order to work with directors and scriptwriters I like, now is the time for me to build upon my strengths. So I will be more active and stack on as much experience as I can. Seto: As for me, after this one year I experienced so much that I now know what I want to accomplish. Which is why, after Ex-Aid, I want to get into many activities, I want to be moving and chasing after curiosity. If it all ties together, I’d be really happy. Interviewer: Thank you all so much. Finally, Ijima, would tell us what you’re aiming for after this. Ozokuka: Ijima really did grow a lot compared to last year. Seto: His outward appearance has also changed. Matsuda: He’s changed a lot! He was helpless at first. (laughs) During the past year, we reshot the opening. I thought he looked so different compared to before. Seto: (pointing out a photo of Ijima) Hey, look! This is him? Onozouka: Your face looks like you’ve burdened it all on your own. Ijima: This is the very first job I had as an actor. I will never forget everything I learned this past year as a Kamen Rider. Moving forward, without forgetting my original resolution, without thinking about what’s in front of me, I want to move forward with my own strength. From here on out, I want to be an actor that has been bestowed enthralling things and passion.